Over the past few years, several customers have asked us to explain the specific terms and purpose of the Support & Updates Plan, so we decided to turn it in to a blog post. Before we talk about that however, we think it makes sense to briefly describe the different types of shopping cart models, and the support implications that go along with them. Examples of Open Source Shopping Carts are: Magento, Zen Cart and osCommerce. With Open Source applications, customers (users) do not pay anything for the software itself, which sounds great on the surface! So, why doesn’t everyone use an Open Source application? The answer will likely vary among those polled, but for the most part, those that choose not to go with an Open Source application (especially for something as important to them as their on-line business) will say it’s because when something goes wrong… there typically isn’t a specific person or company that is going to take responsibility and provide a resolution. In addition, when it comes to integrating 3rd-party services (UPS, FedEx, USPS, Authorize.net, PayPal, etc. ), Open Source applications usually lack the Product Management oversight to keep them current, and these features are often highly integral to the each merchant’s ability to be successful. SaaS (or “Hosted”) shopping carts are ones where the merchant pays a monthly fee for the right to use the shopping cart. Examples of hosted carts are: Yahoo! Stores, Shopify and Magento Go. The major benefit of a hosted cart is the low “cost of entry” for a professionally developed application. Monthly fees for most merchants will range between $20 – $200, which includes hosting, so initially this can be quite compelling when comparing it to a licensed application such as ProductCart… until you do the math over the life of most stores. Technical Support is usually included in the monthly cost, but since the eCommerce provider has complete control over the entire environment (hosting, software, server components, payment gateways, etc. ), the support burden for them is much lower. It’s important to understand that under this model, there is an inverse correlation between the provider and the store owner when it comes to ‘control’. Basically, the more control they have over your site, the less control you have. Licensed Software (such as ProductCart) is where a merchant purchases a license to use the software (similar to purchasing a copy of QuickBooks or Microsoft Office). The licensee does not receive any sort of ownership on the intellectual property itself, but simply a ‘right to use’ the software for a single on-line store. Customers that purchase a license can host on any compatible server and have total control over all aspects of the design, functionality and end user experience… things that are absolute “musts” to many store owners. In addition to offering more flexibility and control, a licensed solution can also be much less expensive over the long run. Many ProductCart merchants have been using our shopping cart for well over 5 years, which means that they would have paid over $3000 under an average (monthly) hosted plan! Hopefully this gives you a general understanding of the different ‘models’ under which a merchant can sell from their own domain/store. 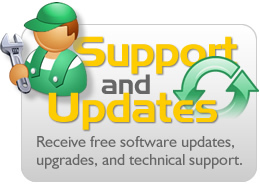 Some of you are probably thinking: “whatever… just tell me why I need to pay an annual fee to obtain Support & Updates!”. Okay… well, the fact is that the price of a ProductCart license simply does not cover ongoing development costs (e.g. writing specification documents, programming new features, updating 3rd-party integrations, etc.). Nor does it cover the cost of providing technical support. Something that we have learned over 10 years of providing a licensed shopping cart application is that over half of the support tickets we receive are actually submitted for issues not even related to ProductCart directly! We understand that it “goes with the territory” of providing a licensed solution, but it doesn’t change the fact that it’s impossible to sustain any software company over the long-term without covering ongoing development and support costs. We believe that most customers realize this, and will also do the math as a way to see that ProductCart (even with the Support & Updates Plan) is still a very good value over many of the alternatives. A final comment to our community on helping us provide timely and meaningful support to you all. It is EXTREMELY helpful to us (and ultimately to you and other customers since it will lead to quicker resolutions) if you take just an extra minute or two when submitting a support request, to provide the relevant information that will facilitate our investigation and troubleshooting process. For example, we often get a support request that states something very generic, such as “My store is not working – please help”, only to find out after several e-mail exchanges that the customer moved their store to a new hosting company and didn’t even mention that in the ticket! So, please provide any information that might be relevant to the problem. This is much more helpful than submitting a ticket with a simple description like “some of my Option Groups can’t be removed”. In a case like that, we have to hunt around the ProductCart Control Panel to find a product that contains options, and possibly even find a specific one where the behavior is occurring (if it’s not across the board). Or in the case of an issue in the Storefront such as “certain products aren’t returning shipping rates during checkout”, please paste a link to the actual product detail page for one of those specific products so we can review all of the relevant settings. It might be that the “No Shipping” checkbox was inadvertently checked… or that the product weight is “0” (which is not acceptable for calculating dynamic shipping costs). The bottom line here is that “specifics” will help us pinpoint the issue more quickly, and get back to you more promptly!